In addressing the growing environmental issues and global population growth, the builders of tomorrow must understand and address city living as a viable solution to our modern day dilemmas. In learning from past cities that are unsustainable, unhealthy, unsafe, and a complete separate entity from the natural world, architects and designers alike have an opportunity to reform the future of city living for a healthier and happier urban standard. This optimistic urban reform seeks to ultimately return modern building culture to a healthier and more natural state, while maintaining equilibrium with the technological advances of the 21st century. 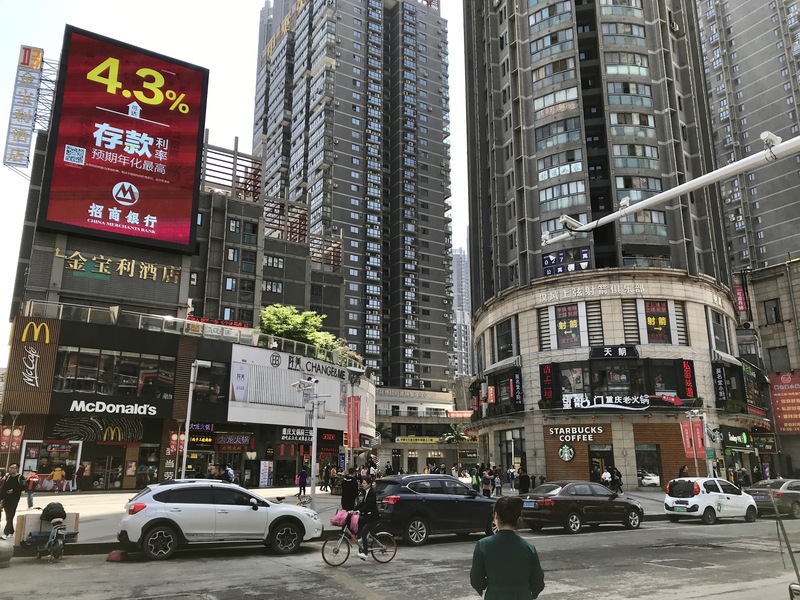 Maybe we were supposed to get this far in the human timeline of achievements, so that we may stop for a minute to examine the clouds of smog that have engulfed Beijing, or the bumper to bumper traffic of the carbon emitting streets of New York City. We live in an era in which we have the ability to harness natural energy and convert it into electricity, by means of photovoltaic panels, wind farms, and various water-related systems. 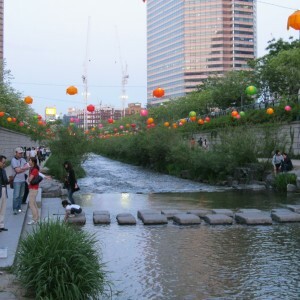 We have the design capabilities to organize urban infrastructure that works with nature rather than against it; by means of storm water management, conservation of plant and tree life, and being mindful of the wildlife habitats that are typically destroyed in city development. We also have the ability to go back and ‘revise’ our mistakes that have been left unattended in our urban mess through adaptive reuse design, in which we may readdress our grey cities with much needed green initiatives. In imposing a productive design upon a preexisting structure of little use or potential, we can create something spectacular out of nothing in a cost efficient and space-conserving manner. 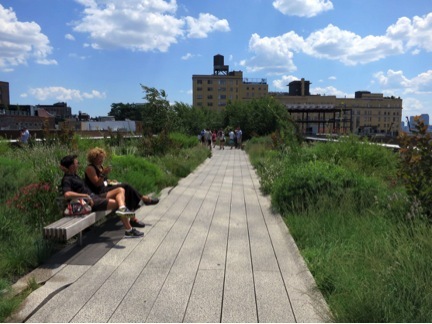 The New York High Line, for example, took what used to be an elevated railroad, and greened it into a park stretching 1.45 miles through the city. Simple, productive, cost efficient, and beautiful. If executed correctly, a strategically planned city can be a healthy and delightful place, not only to work, but also to settle and raise a family in. Cities thrive on the concept that they build up rather than out, as seen in suburban development, allowing for a higher concentration of people to live in a smaller footprint while conserving the natural features around it. Urban dwellers are also less dependent on automobiles, due to the level of proximity that city planning provides. 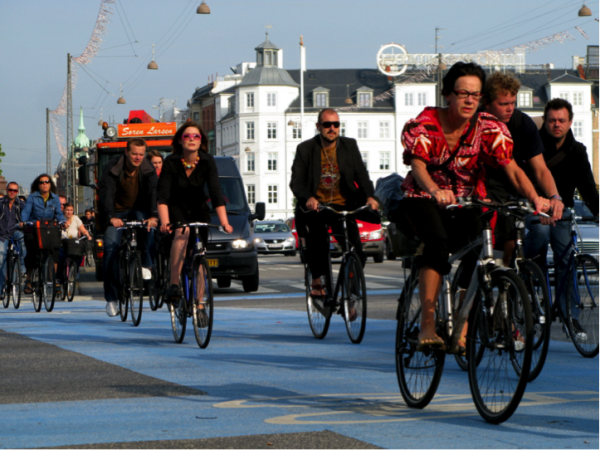 In this instance we may seek to model after European cities such as Amsterdam and Copenhagen, where bicycles are the dominant means of transportation. This cultural facet benefits the environment, the health of the people, gasoline and oil dependency, and of course that hole in our wallet that is gone to the constant maintenance of a vehicle. Imagine a city where bike lanes dominated the carbon emissive infested roads of angry, rushing drivers honking their horns at every intersection? They are plentiful in regions of northwestern Europe, yet few American cities see this as a true priority. Philadelphia is, however, an ambitious exception to this statement; their 2012 Pedestrian and Bicycle Plan seeks to “set new design standards for sidewalks, new policies and programs to enhance pedestrian and bicycle facilities, and strategies for implementing bicycle and pedestrian network recommendations.” This is one of Philadelphia’s many initiatives that encourage adaptive reuse or redesign for a healthier city standard. Philadelphia’s ‘Green Plan’ plan can be found here. Talk about adaptive reuse, what if the flat roofs of every high rising building featured a roof garden? Urban inhabitants may actually utilize an otherwise wasted rooftop space, while gazing into a green-terraced cityscape that looks and feels natural. Or what if common urban components such as sidewalks and pavement were modified for productive rainwater use? These sustainable measures are all part of Philadelphia’s “GreenPlan”, (page 4) in which the city proposes to invest $1.6 billion over the course of 20 years in order to implement porous pavement, vegetated parking-lot swales, rain gardens, and green roofs. Not only would the plan provide scattered habitats for wildlife, and in some instances, locally grown vegetation, but it would also reduce the urban heat island effect; allowing our cities to naturally cool themselves, filter out pollution particulates, and reduce the dire need for energy-sucking air conditioning units. This investment addresses the sustainable well being of the environment, the people, and the economy in a way that also beautifies a once grey-toned city. 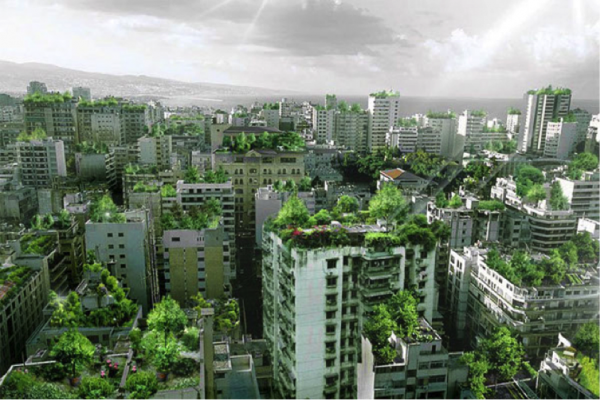 “Sky Forest” is a proposal by Studio Invisible, which seeks to revitalize the aesthetics and environmental quality of Lebanon’s capitol of Beirut. Their mission statement is as follows: “The project works by planting trees on the rooftops to impart greenery and serenity into the urban cityscape. The project also serves the purpose of bringing down pollution, absorb the rain water runoff and improve the air quality. The war-torn city suffers suffocation from the emission from old cars running in congested traffic. In a typical day the city will be loaded with dark smog weighing tons.” If made into reality, Studio Invisible’s “Sky Forest” would be the first of its kind, and most certainly not the last. The true beauty of this project lies in its subjectivity; the fact that other cities in need of beautification and environmental revitalization may ‘borrow’ this idea, and reap the benefits of their own sky forest. Perhaps our current cities in need of revision owe it to the grounds that were destroyed in their construction. 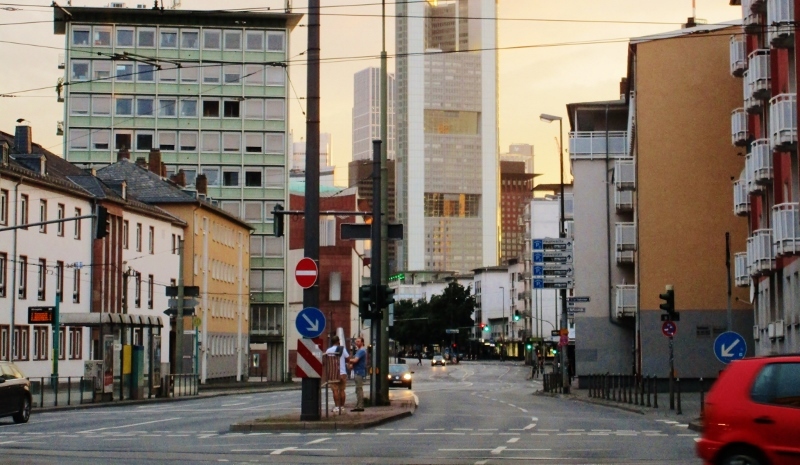 In just about any city, old unused buildings with the proper sun orientation may convert into urban farms, conveniently growing crops and vegetation that can be sold to local markets without the environmental burden of long distance transportation. These buildings that host urban farms will introduce a fresh architectural aesthetic to the city; one that demonstrates the much needed duality between modern technology and the natural world. The rendering below illustrates a redesign proposal of the vacant William Peirce Middle School in Southwest Center City Philadelphia. The primary program includes a library, exhibition space, a café, and a market. 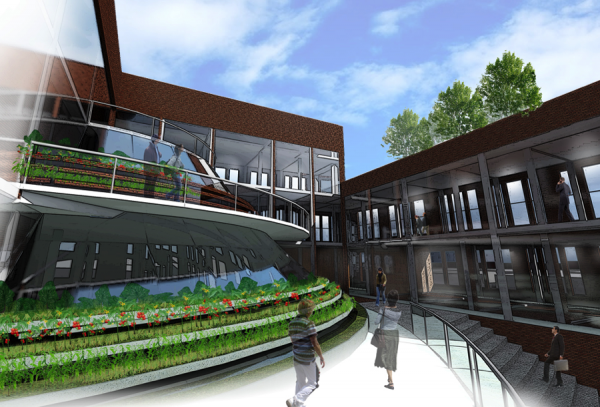 The urban farm becomes a centralized element for the building users to experience, and all cultivated fruits and vegetables are sold to the adjacent market. There are endless possibilities in which we can rearrange our failed buildings into something productive. Nature is where we come from. We are psychologically programmed to respond to the breeze of a spring afternoon and the natural light that should legally have to pour into every single habitable space. We live in such mechanized cities where office workers and city dwellers are deprived of such stimuli, hurting our productivity and further disconnecting us from the things that shouldn’t be. We owe it to ourselves to break free from this grey toned system that has nearly dehumanized us in the name of this ‘modern’ era, and instead design cities where nature and technology may coexist as one cohesive element; both functionally and aesthetically. We must allow ourselves to embrace the beauty of the Earth as we once did before the time of industrialization, while simultaneously implementing our technological advances as one holistic system that neither destroys our land nor wastes our intellectual ability. Again, this is not a utopian dream, but rather a game plan to update our cities to a new level of productivity, and reinvent the standard in which they are devised from. I’m not trying to green-wash every city skyline into some multi-billion dollar green-washed ideology; I just personally think we can do better.